She is Doing INCREDIBLE! Her Usual Voice is Back...Her sense of Humor Never Left...She Gives All the Glory to God for her still being here with us...She Did It!!! All by herself...Just the way she likes it...A Loved one is going to stay and watch over her for the First weeks or so...Just to be Certain she can get around by herself...Although she has been Proving that already. She said she Learned to take care of herself first and Just Leave the housework for later...A Wise Lesson for us all. I hope this brightens your day as much as it has mine! SO HAPPY!!! 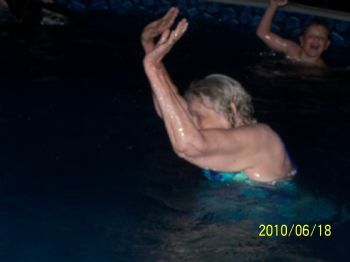 This was the year she cannon-balled into my pool...at the time she was 86...She is heading Toward 93 this Summer. Isn't this Happy News?!?!?!?! I am beside myself. That is wonderful!! So glad to hear. Oh Yo, great news...best way to start today! This makes me thrilled for both of you...a whole lot of faith and the willingness to take care of herself, AMEN! She is one amazing lady!! Glad she is back home. I hope she can enjoy her life to the very end! Give her our best.